I could read Sonya Sones’ novels in verse all day…and I have. 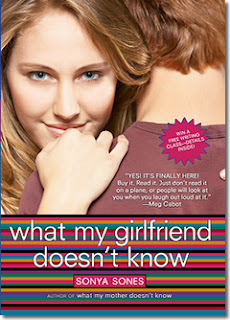 What My Girlfriend Doesn’t Know is the sequel to the excellent What My Mother Doesn’t Know, which details Sophia Stein’s romantic travails, ending with her dating the outcast Robin Murphy. What My Girlfriend picks up at the exact moment the previous left off, this time from Robin’s point of view. I love the character of Robin--he is so sweet and beaten down, to the point that “Murphy” is synonymous with loser. There's a moment when he realizes the insult has gone beyond his school, and it is shattering. People turn on Sophia for dating Robin (including the friends I praised in my previous review) and suddenly "Stein" is an insult as well. Robin agonizes over breaking up with Sophia to save her socially. I enjoy reading about life from the outcasts' point of view. As a teacher, it motivates me to look out for potential "Murphys" at my school. Luckily, Robin has a teacher who sets him up with art classes at Harvard (love books set in my hometown), which gives him insight into life beyond high school. In the real world, he is a cool, talented guy that is well-liked. While I don't think this book will appeal to male readers (especially with this cover), I hope that the girls who read this feel comforted by this information, or act kindly towards less popular students in their schools. If you like novels in verse, you can't miss these books.